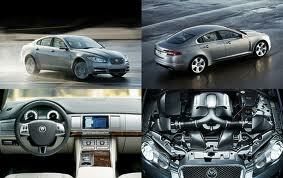 On August 28th 2007, Jaguar unveiled their replacement for the existing S-Type saloon: the Jaguar XF. True to the Jaguar philosophy of creating Beautiful, Fast cars, the XF goes further, adding a new dimension to the marque. The four-door XF has the visual excitement of a coupe, but room inside for five adults to enjoy an interior wholly contemporary in style yet uniquely Jaguar. Jaguar-XF-Dials as well as space, the new XFs interior ambience is enriched by crafted, luxurious materials, sophisticated instruments and calm interior mood lighting. Engineering excellence and attention to detail mean the XFs interior matches the best-in-class for refinement, while Jaguars intelligent use of technology and driver-friendly Touch-screen controls add new layers of comfort and ease of use. Every XF model has shift-by-wire transmission control, with Jaguars sequential shift system, its popularity already confirmed by feedback from Jaguar XK sports car customers, used for the first time in a saloon. Shift-by-wire replaces manual shift linkages with electronic commands and gives every XF rapid and very smooth gearshifts. The Jaguar Sequential Shift System gives the driver the option of one-touch manual gearchange control via steering-wheel mounted paddles. There are also multiple JaguarDrive Control transmission modes, including Dynamic and Winter settings, which interact with throttle progression, Dynamic Stability Control thresholds and shift strategy to match mood and conditions. The most exciting feature of the XFs transmission control is the all-new Jaguar Drive Selector, an industry-first rotary shift interface that combines precise, intuitive control with space-saving packaging, to allow maximisation of interior storage options.